AS BALI'S Mount Agung continues to erupt, it's the dangerous ash cloud that's most likely to affect Australian travellers. 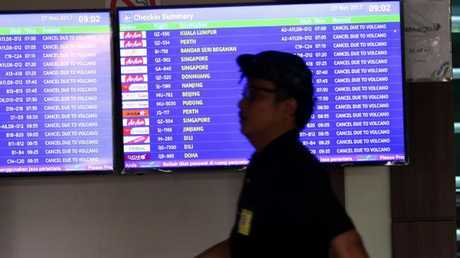 Saturday's volcanic eruption has seen a massive plume of volcanic ash rise thousands of metres into the air, which caused Denpasar international airport to close on Monday, stranding more than 59,000 passengers, and leaving major carriers such as Jetstar and Virgin Australia with little choice but to cancel all flights between Australia and the holiday island. Before the airport was closed on Monday, it was up to individual airlines to decide whether or not they wanted to continue flying. Now Virgin Australia has explained the process it goes through to determine whether or not it will fly after a volcanic eruption, and why it may sometimes seem to be a random process - especially to the thousands of stranded and desperate passengers hanging on every update. WHY IS THE ASH CLOUD SO DANGEROUS? As the world saw with the catastrophic eruption of Iceland's Eyjafjallajokull volcano in 2010, which effectively shut down air routes over Europe, volcanic ash can have an enormous impact well beyond the erupting volcano itself. Volcanic ash is not the same as ash that remains after a fire. It's made up of tiny, jagged particles of volcanic glass, as well as fragments of minerals and rock, and it travels far. This not only makes visibility difficult for pilots, but it can be catastrophic to aircraft. "Because the glass fragments are quite jagged, and it is glass - it's not like the ash that disintegrates in your fingers, it's actually little fragments of rock - they can abrase the pilot's windows and they can get into the engines," associate professor Heather Handley from Sydney's Macquarie University recently explained to news.com.au. "And when it's in the engines, because it is rock, it can start to melt as it gets hot. And then as it gets further into the engine it can start to fall and cause engine failure. So there is a risk." Emile Jansons from the Bureau of Meteorology's Volcanic Ash Advisory in Darwin told news.com.au that while an ash cloud has never been responsible for a plane crash, that was the fear. "[Volcanic ash] has the potential to shut down jet engines if the plane is in the wrong place at the wrong time ... and that's why airlines are very responsible in their flight planning," he said. In a new post on its blog, in light of the Mount Agung eruption, Virgin Australia said it carried out a risk assessment during volcanic eruptions to decide whether or not it was safe to fly. The airline's operations team receives regular reports from the Volcanic Ash Advisory Centre, which has been monitoring the Bali volcano from its base in Darwin. Those reports include details about the eruption and updates from local volcanologists, wind and weather conditions, and extensive satellite imagery and models. "As part of this process, the team will consider alternative flight paths, whether there are other options to get our guests moving again, and any restrictions that need to be considered to continue operations," the airline said. "At Virgin Australia safety is always our number one priority, so this will always come first. It is also important to remember that volcanoes can erupt continuously over many months, which is why sometimes flights can be impacted for a long period of time." The airline also addressed why flew some days during an eruption and not others. "The changes in weather can significantly impact the ash cloud including its direction and density," Virgin Australia said. "We constantly monitor the weather along with the ash cloud to determine the safest possible route to fly our aircraft. Depending on the direction of the wind, we may need to alter our flight path or make the decision to cancel a flight in the interest of safety." Each airline has its own approach to safety and risk assessment, which is why some airlines fly at times others don't. 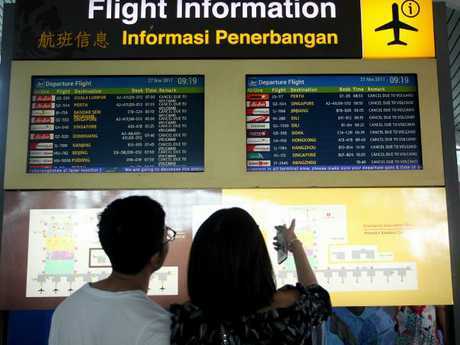 But now that Bali's Denpasar airport has closed, airlines have few options. HOW DO PASSENGERS KNOW IF THEIR FLIGHT IS CANCELLED? Virgin Australia says it has been keeping passengers updated via emails and text messages during Mount Agung's eruption. It is also asking people who booked through a third party, such as a travel agent, to make sure their contact details have been passed onto the airline. Most airlines are updating passengers with live updates or the status of flights on their website, including Virgin Australia, Jetstar, and Qantas. When it is safe to fly, Virgin Australia said it would contact passengers to let them know if they have a seat on the next available flight. 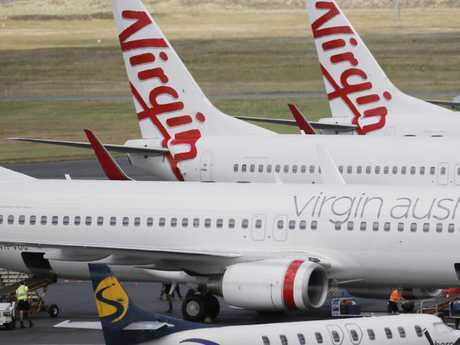 "Your safety is our priority and if we need to cancel your flight, we will automatically move your booking to the next available flight and send you the details," Virgin Australia said. "However, please note that if the volcano continues to impact our ability to fly safely in coming days, there may be subsequent flight cancellations. "Please remember to check your flight status here before heading to the airport." Travellers are advised they can to contact their airlines - or third parties such as travel agents, if they've booked through one - to discuss changes and cancellations to their flight. Travellers are also urged to get in touch with their travel insurance provider to see if they will be covered for any activities related to the volcanic eruption, as not all insurance holders are covered. 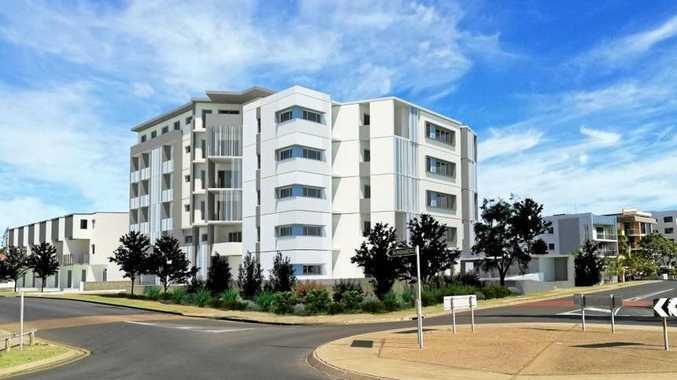 The Department of Foreign Affairs and Trade is also keeping travellers updated on its Smartraveller page. The latest advice is to follow the directions of authorities, stay away from the 10km exclusion zone around Mount Agung, and prepare for the possibility booked flights will not go ahead as scheduled.